Our family has been in the industry for 30 years and we take great pride in providing our Canadian lake wild rice and pasta as a healthy alternative. As a family owned and operated company, we grow our wild rice crop in pristine Northern Manitoba lakes without using pesticides or fertilizers. We strive to provide top quality organic products to our customers from Northern Manitoba, to Winnipeg, across Canada, the United States and overseas. For more than 8 years, we have been carrying a line of dehydrated soup mixes that you will surely love. We offer a great deal for all health conscious food lovers in Canada and abroad. One of the most popular of our four soups is the wild rice vegetable soup, which is made with our own organic wild rice. Our wild rice pasta vegetable soup mixcontains our very own wild rice pasta. This soup of vegetable and pasta mix is easy to serve and has no preservatives added. Our organic wild rice, vegetables and pastas are certainly rich in vitamins, minerals and dietary fibers and add a “WOW” to any meal. Our Canadian organically grown wild rice is grown in Canada’s pristine northern lakes. Our Manitoba product is an organic product that possesses superior nutritional value while providing exceptional flavor. In addition, it is gluten-free, high in protein, high in fiber and low in fat (and of course exceptionally delicious)! Manitoba wild rice has a flavor reminiscent of “nuttiness” and can be enjoyed with a vast variety of foods. Preparation is also simple, unlike traditional rice, which requires precise measurements and water ratios. It can be prepared with water or stock and simmered over low heat for 40 to 60 minutes. When shopping with Wild Man Ricing, you’re purchasing the freshest rice in the Canadian market! What do we mean by “Certified Organic”? Certified Organic refers to the fact that the rice from Wild Man Ricing has been audited by an independent certifying agent: OPAM (Organic Producers Association of Manitoba) and fulfills the standards to ensure the wild rice is grown in soil/water that is free of pesticides, insecticides and other contaminants. It is grown naturally without using hybrids that have been engineered for high yields at the expense of quality and taste, so supply is limited and once the current stock is gone, it’s all gone until next fall’s harvest. Please take time and enjoy browsing our website to witness what we do best. Our website is complete and updated on anything and almost everything about the products we offer and other helpful information that you need to know. For more inquiries, feel free to call Tony at 204-794-7068 or Richard at 204 624 5054. Please phone for wholesale pricing for large orders. Thank you for visiting and we look forward to hearing from you soon! 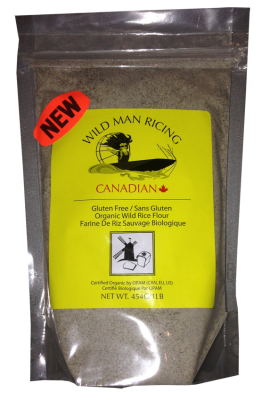 We are now offering Gluten Free Organic Wild Rice Flour!